Algernon Moncrieff, a bachelor-about-town, has invented an invalid friend called Bunbury in order to get out of tiresome family engagements. At the same time, his friend Jack Worthing has invented a wicked brother called Ernest to disguise his own misdemeanours. When Algernon poses as Ernest to win the heart of Cecily Cardew, confusion reigns, and it takes the discovery of an old black handbag to reveal the truth... Oscar Wilde's dazzling comedy about mistaken identities and secret engagements still delights audiences over a century after its first performance in 1895. 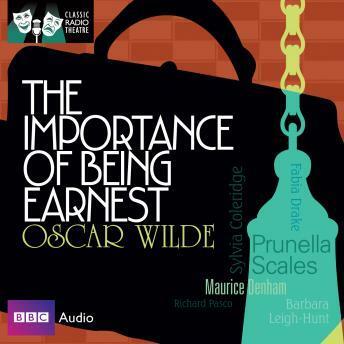 This BBC Radio production, first broadcast in 1977, features Jeremy Clyde as Algernon, Richard Pasco as Worthing, Prunella Scales as Cecily and Maurice Denham as the Rev. Canon Chasuble, and is the first broadcast of the original four-act version of the play. The Classic Radio Theatre range presents notable radio productions of much-loved plays by some of the most renowned playwrights, and starring some of our finest actors.